After hearing each non-profit's presentation, Team HelperUpper decided that the most feasible, and also most exciting project, would be Understanding Poverty's proposal for a "Yelp for Impoverished Individuals". With backgrounds working on social-impact mobile apps (including a similar project for homeless individuals called Home App), this was the perfect problem for this team to tackle. 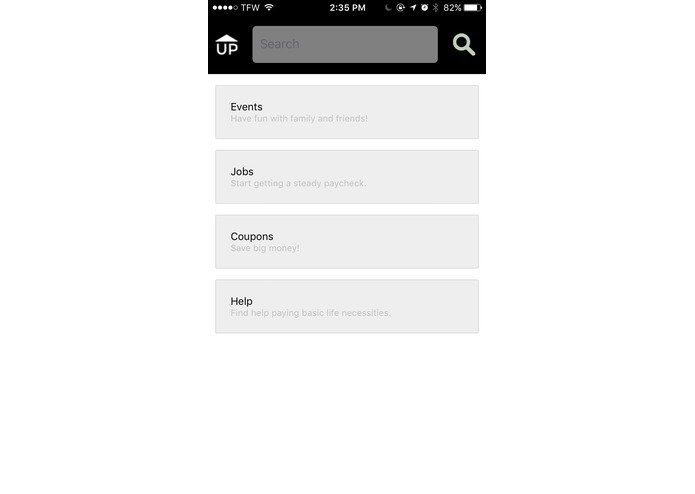 HelperUpper allows users to access and review resources ranging from Jobs to Non-Profit Help, from Events/Activities (particularly for children) to Coupons/Discounts. This can be done from clients for both iOS and Android. The backend is built in Node.js using Express and Firebase. The frontend is built using React Native, which compiles natively for both iOS and Android. A variety of libraries, such as AirBNB's react-native-maps, were also utilized. Our demo server was tunneled through ngrok. Every error imaginable on both sides of the project, both in terms of spelling mistakes and unresolved errors with the compatibility of react-native packages with the current version of react-native. Creating a fully-functional live app after hours of being completely lost. As always, more about the frameworks and tools that we used, as well as the way apps can be structured for use by potentially non-technical users. Hosting the server online, finishing development of Event Maps (dependent on issue resolution of react-native-maps), and beginning public deployment! Created Event Maps view and worked on various frontend components. I designed and implemented the app (views, transitions, components, interaction logic) and connected it to the back-end.